New State Music recently announced the Friday 27th July release of a retrospective compilation celebrating the summers of 1988 and 1989 and the birth of the cultural movement known as ‘acid house’. 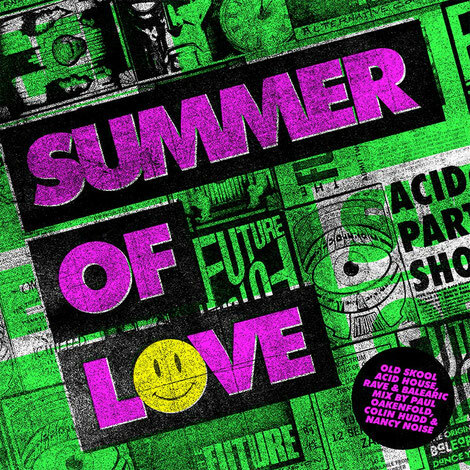 ‘Summer Of Love’ is a 3CD mix album of acid house, rave and Balearic classics curated and mixed by possibly three of the genres’ most high profile and historically documented DJs, Paul Oakenfold, Nancy Noise and Colin Hudd. The collection features records associated with the DJs respective club brands Spectrum, The Land of Oz and Future including key tracks by house originators Frankie Knuckles, Marshall Jefferson, Phuture, Fingers Inc and the No.1 single from Steve ‘Silk’ Hurley, ‘Jack Your Body’. The album also features UK top 10s from 808 State ‘Pacific State’, Men Without Hats ‘Safety Dance’ and top 20s from It’s Immaterial, The Art of Noise, Bizzare Inc, Orbital, The Jungle Brothers, Stretch and Stacker Humanoid. Plus the underground club hits that made up the scene and scene favourites by bands The Cure, The Residents, Thrashing Doves and Yello. During the summer of 1988 and 1989, a new cultural movement (known culturally as Second Summer of Love) was borne out of a desire to dance to the uplifting house sound of Chicago as enjoyed on the buzzing Balearic club scene of Ibiza, where a new type of all-night party lifestyle had been met with enthusiasm by UK clubbers. Upon their return to the UK, a new style of raving emanated from the underground club scenes of London and Manchester known as acid house, creating a mania referred to as the Summer of Love. The fervent demand to dance to electronic music spread like wildfire across the fields and disused warehouses of the UK, Europe and beyond, metamorphasising into the global rave scene enjoyed today. Paul Oakenfold is the man widely recognised as the protagonist of what we now know as acid house and the rave scene, and an internationally acclaimed DJ, producer, remixer and film soundtrack composer. Paul kicks it all off on CD1 bringing the sound of Spectrum, the acid house party at Heaven, mixing up classics from the likes of Frankie Knuckles, Marshall Jefferson, 808 State and Steve ‘Silk’ Hurley alongside more esoteric tracks form Sueno Latino, The Residents and even ‘80s ‘wild child’ Mandy Smith. Colin Hudd is the London soul, funk and boogie DJ who apparently was one of the first DJs in the UK to start playing US ‘House’ music and influenced a raft of DJs thereafter. CD2 presents the sound of The Land Of Oz, also held at the nightclub Heaven in London, featuring a blend of acid house and rave classics that takes in anthems from Quartz, Rhythim Is Rhythim, Bizarre Inc, Orbital, Joe Smooth and CeCe Rogers, together with a healthy side of ‘hip house’ from the Jungle Brothers, Fast Eddie and Jungle Crew. Nancy Noise was probably the first female DJ to really make a name for herself and break down the doors of the formerly boys only club of DJing with her own distinct sound. Nancy’s mix includes moments from The Cure, Art Of Noise, Shakatak, Men Without Hats, Yello and more eclectic cuts from It’s Immaterial, Thrashing Doves and Stretch.